September is my favorite month of the year. It marks back to school, football, fall activities and decorations, and the return of my TV shows. But more notably, it’s also the month of my birthday, the month we found out about our little “bean” (aka Bridget as we know her today), and our anniversary. This September 27, Brian and I hit the milestone five-year anniversary. We had originally planned to get away for a weekend in August, but life happened. So we took this past Thursday and Friday off of work instead. Thursday, we ran errands, took Bridget to the doctor (she is “off the charts” in height! ), and shopped for our annual fall outdoor decor. Friday, our actual anniversary, was our day to celebrate with each other and it was perfect. We dropped Bridget off at daycare at the normal time. We shopped with our allotted budget for our anniversary gift (we’d both been wanting to spruce up the old wardrobes), and had lunch at Red Lobster. I realize lunch at Red Lobster doesn’t sound like the proper way to commemorate five years of marriage, but we like their food and hadn’t eaten seafood since before I got pregnant, so it was the obvious choice. And boy was it good. We then went to see the movie We’re the Millers. We don’t get out much, so I don’t have much to compare it to lately, but this movie was hilarious. It ranks up there with The Hangover and Bridesmaids in my book. We topped off our day with ice cream. Although I felt guilty at first about taking Bridget to daycare on our day off, it allowed us an entire day together, with no worry about babysitter check-ins or costs. And having our date during the weekday, allowed us to spend the rest of the weekend as a family. It was a win-win for all. 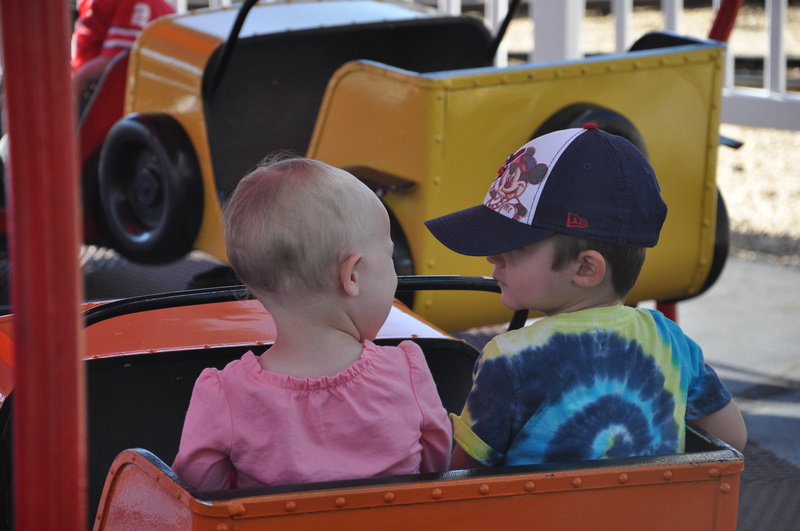 We finished our September celebration at the Memphis Kiddie Park. This was our first time there, so we weren’t sure what to expect. As a born and raised Northeast Ohioan, my “amusement park” bar is high, and this kiddie park is approximately .01/100 size of Cedar Point. It’s straight out of the 50s, has no more than 6 rides, and is smack dab in the middle of the ghetto. 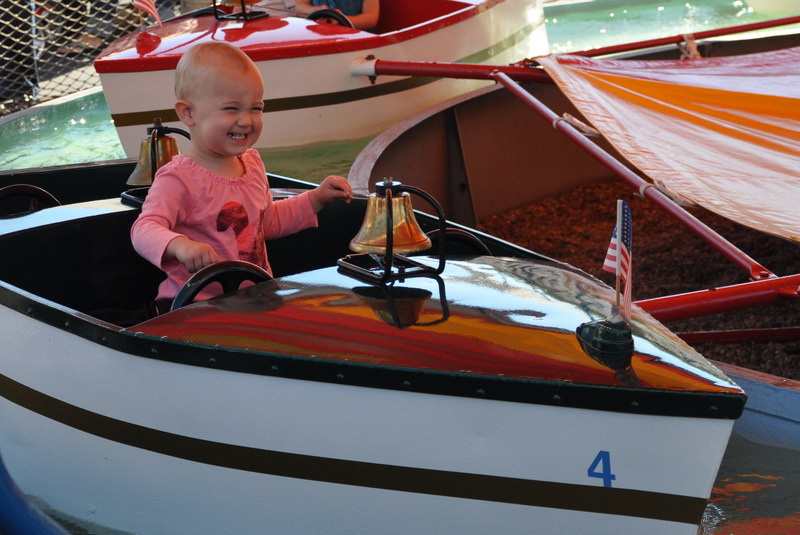 But, it’s designed for small kids (up to 50″), inexpensive, has short lines, and after her initial hesitation, Bridget had an absolute blast; and so did we watching her. Here are a few pictures from the park, including one with Bridget and her friend, Jake (the son of our friends’, Joe and Kelly). Today was jam packed. We spent the morning at Memphis Kiddie Park (more on that later), had lunch at Cozumel, and enjoyed the afternoon with my family. There was one task hanging over my head that I just wanted to cross off the list today so tomorrow can officially be agenda-free: grocery shopping. Blah. So we headed out to Giant Eagle, “raced” around the store, desperately tried to keep Bridget entertained during the ridiculously long checkout line, and then loaded up and headed home. As I mentioned, we crammed a lot into today and by the end of it, Bridget was exhausted. We didn’t want her to fall asleep on the ride home so as I drove, Brian was pulling out all the tricks to keep her awake. This was part of their conversation, and 30 seconds of my life I so badly wish I could live over again but with a video camera in hand. I guarantee we couldn’t have the same conversation again given that we had never even heard her say “bof” before, but boy was it one I don’t want to forget. One of those incredibly rewarding parenting moments that makes the challenges totally worth it. Today, I kick off the last year of my 20s. My first 29 years have been good to me, so I have no reason to feel otherwise about my quickly-approaching 30s. As a teenager, when asked where I see myself by the age of 30, I answered in so many words, “married with children, and a good job.” Check. Check. Check. God has blessed me in tremendous ways. But in my head, there were two other “dreams” I had for myself: to be an anchor on the Today show, and have a published novel. Clearly, I’m not sitting next to Matt Lauer on weekday mornings, and if I had a published novel, I probably wouldn’t be channeling my inner-author through this blog. I don’t particularly care for Matt Lauer after recent news and I quite like the new home we bought here in Ohio last spring, so I’ve surrendered the idea of being the next Meredith Vieira (after all, she IS the best female Today show anchor). But I’m not ready to give up on writing that novel. On July 16, 2012 when I introduced myself to the blogosphere, I said, “As I approach 30, reality has set in. I probably won’t write a novel; at least not one for publication.” I am determined to prove my then 27-year-old self wrong. Three weeks ago, I was walking down the sidewalk with Bridget and she let go of my hand to pick a white dandelion from the grass. I can’t explain why (yet! ), but I had an immediate moment of clarity—a realization of the novel idea I’d always had somewhere in the back of my mind. I’m now roughly 5 hours and 3 pages into my novel, with ideas flowing through my head like a well-oiled machine. I have no idea if this aspiring novel will amount to anything, but if I don’t follow this revived momentum, I’ll regret it. So here I go, attempting to check that last box off my by 30 list. At the pace I’ve been going, a year may be ambitious, but I’ll settle for a solid start. Oh, and if my blog post volume is light this year, now you’ll know why. Stick with me, readers. Maybe one day I’ll sign my bestseller for you. Ha! A girl can dream, right? Imagine this picture taken in 1997. A time before flat irons existed, sausage roll bangs were in, and Umbro shorts with Adidas shoes for girls were the fad. Thank goodness that exact picture is buried in my boxes alongside other middle school and high school memorabilia. But it exists. Same girls, same pose. Except we were sitting in chairs in a row brushing each others’ frizzy hair. This group of my friends have known each other since we were in grade school (or since birth for me since the brown curly-haired beauty is my cousin). We experienced so much of our youth together; the good, bad, and everything in-between. We remained friends through college, celebrated each others’ weddings, and are still friends today. We may not all see each other as much as we wish, but when we get together, we pick up right where we left off. 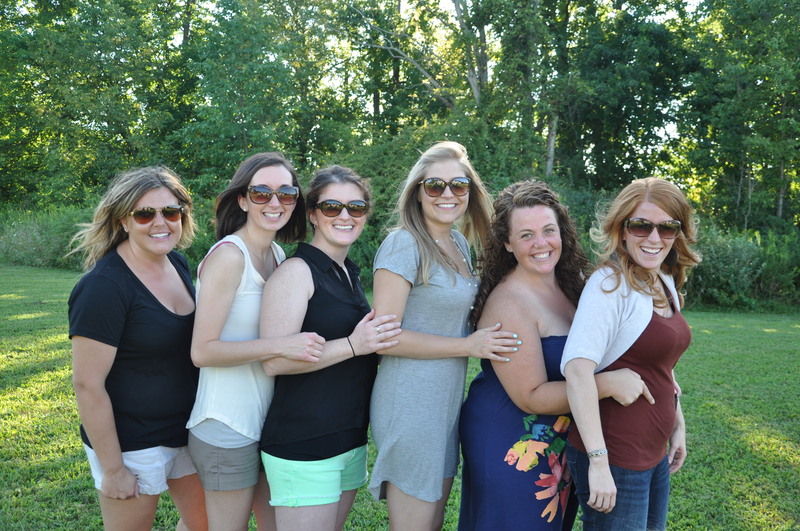 Erin hosted all of us and our families for a summer cookout a few weeks ago. 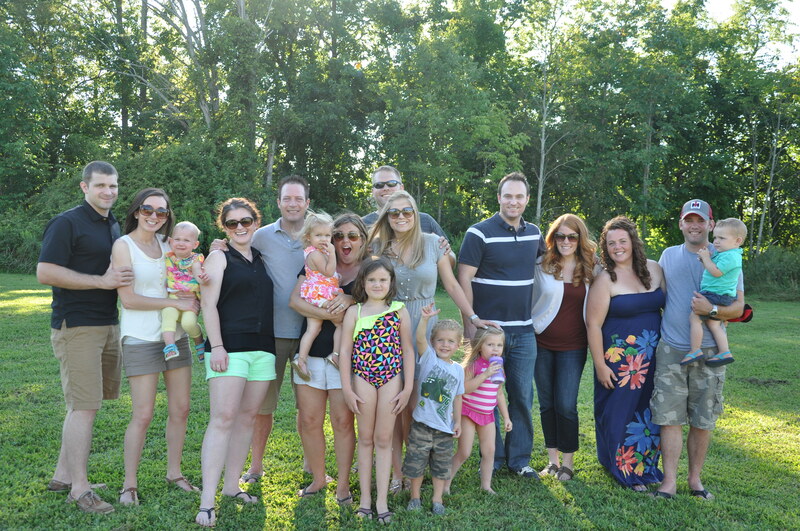 It was such a blessing to spend the day with this group of friends, their husbands, children, and niece and nephew. We vowed to plan at least two of these get-togethers every year, and I look forward to seeing this group continue to grow. Happy 202nd birthday, Johnny Appleseed! September 26 marks the 202nd birthday of Johnny Appleseed. Don’t worry, I didn’t know that either. To be honest, I don’t know much about Johnny Appleseed. But I now know that Mapleside Farms in Brunswick, Ohio throws a darn good celebration in honor of his birthday. This weekend was the 40th annual Johnny Appleseed Festival at Mapleside Farms. 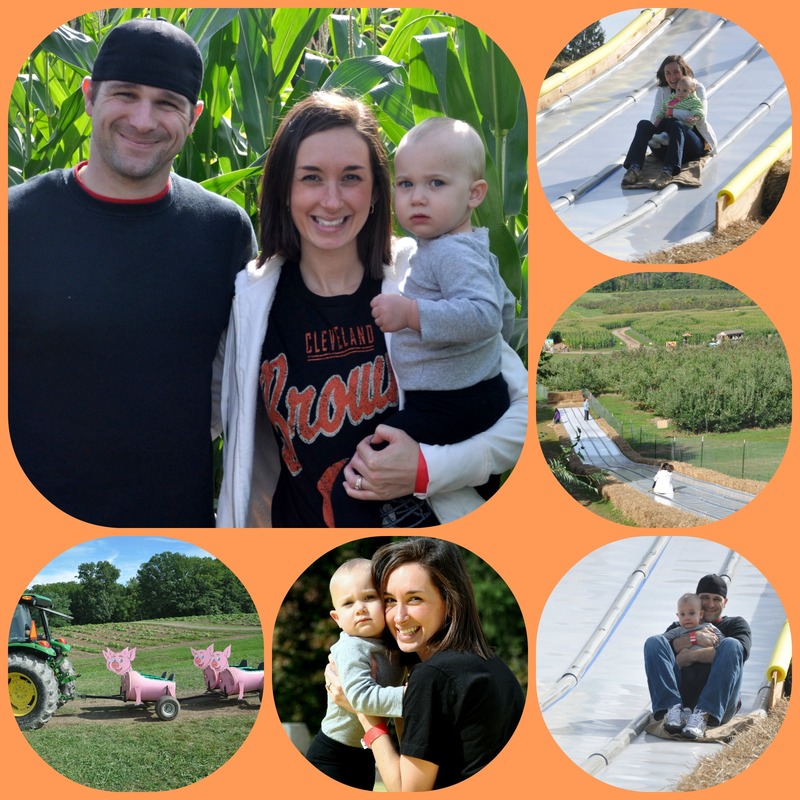 It was our first time visiting the farm, but I had always heard that it was THE place to enjoy the fall in Northeast Ohio. I can now confirm this to be true. We had the best time there today. 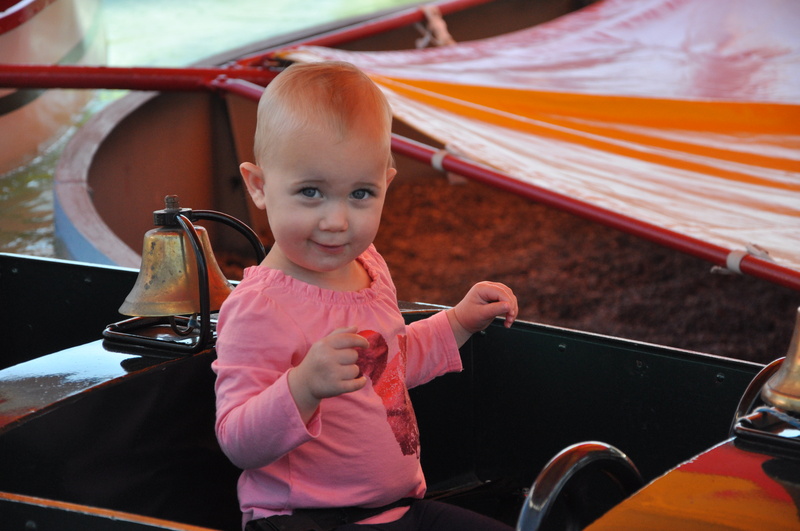 For $12 each (children under two get in free), we took full advantage of the farm’s activities. We took Bridget down America’s longest slide of 350 foot. We think she liked it, but our pictures tell us she wasn’t so sure. We took a pig train ride through the corn field and apple farm. We know she loved this as she giggled and pointed at the apple trees as we passed by. We walked through the beginning parts of the corn maze, and then finished the morning bouncing on the largest trampoline pillow in Ohio. We left with a gallon of fresh apple cider and homemade cheese popcorn; both of which may not see the end of today. 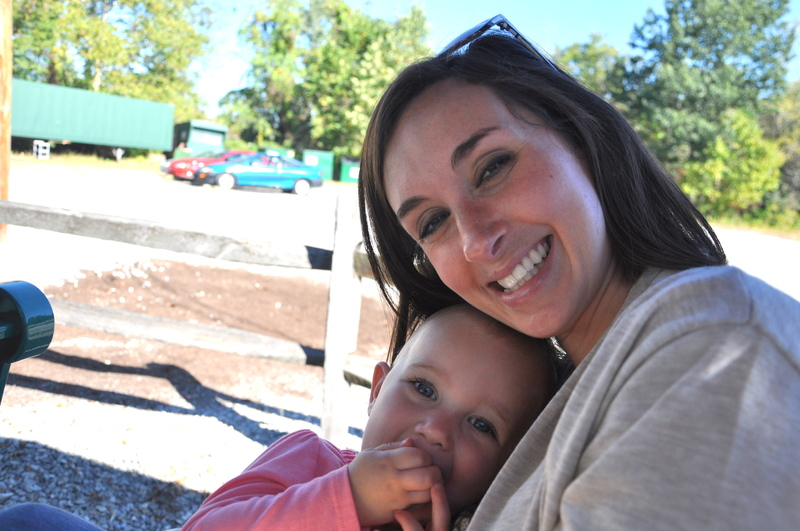 If you live in Northeast Ohio, you must add a visit to Mapleside Farms to your fall to-do list. We are planning to head back in October when the leaves have turned to enjoy the beautiful acres in view. In an attempt to document Bridget’s going-by-way-too-fast baby and toddler-hood, here are some of her adorable, quirky, and funny habits. She has a thing for collecting. Rocks, mulch pieces, and acorns are currently her favorite items. Some would even consider her collecting to be “hoarding”. When we play outside, which is what we do every minute we can because she absolutely loves it, she will find a rock or other small item and carry it with her until we’re forced to take it away for a meal, naptime, or bedtime. She doesn’t attempt to eat these items (thankfully! ); she just likes to carry them around. To commemorate these belongings that she so carefully finds and chooses (because not just any rock makes the cut), I use them in the centerpiece on our table. I figure that a collection of her rocks that Mom kept will make for a good laugh in years to come, and in the meantime, it gives our otherwise generic centerpiece some character. Every day, Bridget’s learning new words. She’s like our little parrot repeating words when asked. I know I am biased, but when she says her two new words, “turtle” and “purple”, it’s quite possibly the cutest sound I have ever heard in my life. I am so glad that Bridget enjoys reading. She is not yet interested in television (unless the Chuggington theme song is playing and then it’s like “see ya later, book”). She will pick out a book from her basket and turn around to back up into our lap. We’ll read the story, and if she likes it, we’ll read it a few more times. We play this routine every night for about 30 minutes before bedtime. We’re getting our tax dollars’ worth of library patronage, that’s for sure! Bridget discovered the “fun” of climbing onto the furniture. At first, when either Brian or I were sitting on the furniture, it was sweet because she was climbing up to us. But, when we’re not on it and she wants to be, we attempt to teach her that it’s not okay to climb on the furniture. Not only does she not listen, regardless of how we say it, but she smiles and laughs as she keeps doing it. Hopefully this is a phase until she better understands the meaning of our words, but part of me thinks it’s just another glimpse into her stubborn personality. After all, “let’s go play outside” and “it’s time for a snack” seem to come through loud and clear. Selective hearing, perhaps? 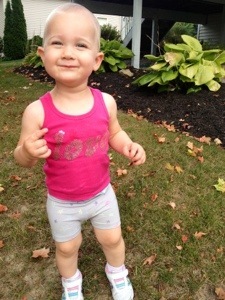 With Labor Day being the unofficial end to summer, we dressed Bridget in some of the last of her summer gear. She’s officially outgrown 12 month and giving her 18 month clothes a run for their money. As my husband put perfectly on his Facebook caption to this picture, “When we dressed Bridget this morning, we had no intention of making her look like Richard Simmons.” We got such a good chuckle out of her in this outfit. Now it’s time to pack away yet another round of her clothes. I’m still looking for that pause button if anyone out there knows where to find it.